Enactus Sheffield - Motion a social enterprise that designs and delivers chair-based exercise sessions with the intent of increasing physical mobility, reducing social isolation and improving quality of life of the elderly in care homes. Enactus Edinburgh - Slurp an enterprise that aims to help homeless young adults get the work experience and financial support necessary to assist in securing a stable job in their desired field. They are breaking the homeless cycle through a soup and bread making enterprise. 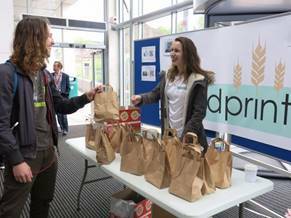 Enactus Nottingham - Foodprint a project that works towards battling food waste through redistributing close-to-expiry date food. Its aim is to create a market for food which would otherwise be disposed of by big conglomerates, and develop a demand for cheaper than retail price/quick use food.